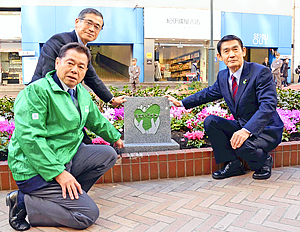 The association to promote the Shibuya Koen-dori shopping district in Shibuya Ward, Tokyo, has established a stone monument carved with the words "Madei life" in a flowerbed in the shopping district. Madei life is the catchphrase for development in the village of Iitate, Fukushima Prefecture, which the association has supported since the accident at the Fukushima No. 1 nuclear power plant. It means "in a polite way" or "from the heart" in the local dialect. At the unveiling ceremony, association head director Kazuo Komatsubara expressed his desire to continue supporting the village as the sixth year anniversary of the 2011 Great East Japan Earthquake approaches. "We want to back up the village of Iitate and Fukushima Prefecture for years to come," Komatsubara said. The 50-centimeter-square monument is located in a flowerbed in front of Rakuten Cafe near the Hachiko Exit of JR Shibuya Station, where many young people and foreign tourists come and go. Hidemitsu Tsukakoshi and other members of the association decided to set up the monument in one of the busiest downtown streets in Tokyo in a bid to ensure the disaster-stricken area is not forgotten. Norio Kanno, the head of Iitate village, and Reconstruction Minister Masahiro Imamura attended the ceremony. Cyclamens cultivated by students at Fukushima Prefectural Soma Agricultural High School in Minamisoma, Fukushima Prefecture, were planted around the monument. At the ceremony, Kanno introduced the idea of using a statue of Hachiko made of iron wire, which the association presented to the village in 2013, at a ceremony commemorating the lifting of evacuation instructions scheduled for March 31. The wire statue is 1.6 meters high, 1.5 times the size of the famous statue of Hachiko in front of JR Shibuya Station. The association donated it to symbolize the wait for the return of villagers who left, as Hachiko awaited the return of its owner in front of Shibuya Station. The wire statue is now located in Iitate Home, a special nursing care home for the elderly in the village. Kanno said: "The evacuation order will be lifted on March 31. I'd like to put the wire statue of Hachiko at the entrance of the village office to welcome as many returning villagers as possible. Hopefully, such a ceremony will take place."